Getting natural meat is important for your health and the health of your family. Don’t let your family eat sub-par meat. Our goal is to provide you with the highest quality meats while helping you save money. Come to Calgary Meats for natural beef, Alberta fresh pork, free range chicken, and cold cut deli products. With the range of natural and exotic meats we carry, you’ll be able to find unique and competitively priced meats for any meal that you’re planning. From sausages to our Cowtown jerky, you can’t go wrong. 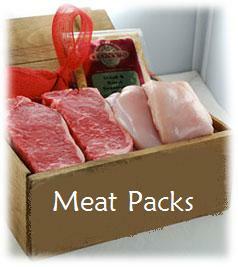 We have the most stringent quality standards of meat at Calgary Meats. If we wouldn’t buy the meat ourselves, then we would never sell it to you. You know that you’ll always be able to rely on the quality at Calgary Meats. We pride ourselves on having the best selection of meats in the business. From beef, lamb, pork, poultry, veal, game and small goods you’ll get everything you’re looking for. Let our professionals walk you through the store and help you handpick the perfect meats for you and your family. We guarantee your satisfaction when it comes to providing quality, fresh meats that taste better than anything you’ve ever had before. Stop by today, we’d love to see you.